I believe it was about two years ago that I made a very simple series of gift tag projects during the fall. I enjoyed working on them because they were quick and they gave me some crafty time that I many not have had otherwise. I'm going to start up another series of simple projects. Instead of my usual photo tutorials, I'm going to make short videos. 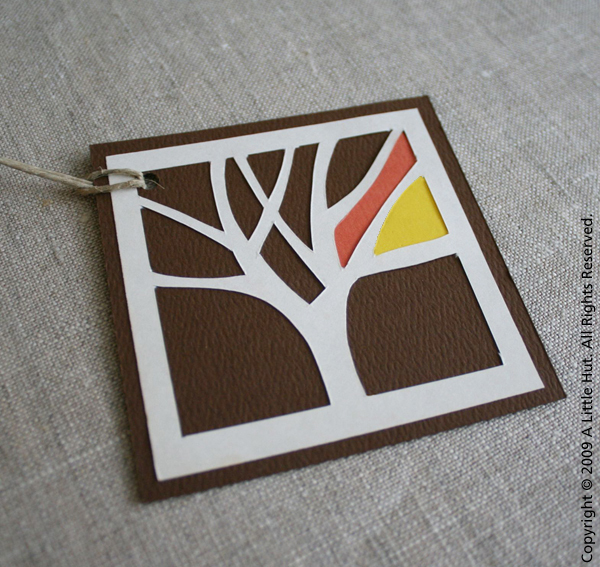 As a warm up, I worked on a simple autumn themed gift tag to welcome the first day of the season. For those of you with more experience, please keep in mind that some of the steps are very basic. I've taken the approach of assuming that beginners would find this more useful. The other thing is that there are no fancy cutters or tools in this tutorial. I want to keep the gadgets to a minimum — no huge investments here. This is only the second video I make and I know there are many issues to be conquered (editing, lighting, maybe the addition of some music etc. etc.) so please bear with me. If you don't mind watching me stumble a bit, these videos will also be a great way for me to learn something new. I feel like I'm talking rather slow in this video so I'll definitely be speeding things up for the next one. More editing to make the project go faster will also be a priority. If you have any helpful suggestions or critiques I'd be happy to hear them too.